Bleeding Heart Bakery Cafe, 1916 W. Chicago Ave.
Join your neighbors for Christmas cheer Monday at the annual East Village Association holiday party. This year's event is a potluck dinner in the upstairs mezzanine of Bleeding Heart Bakery Cafe, 1916 W. Chicago Ave. A cash bar will be open from 6:30 to 9:30 p.m.
Bring a food dish of your choice to share, or buy from among the bakery's renowned sampling of sweets. December's confections include the Veruca Salt vanilla cake with salted caramel, an English Pea cupcake with creme fraiche mint frosting, and Thai Me Up (coconut, mango, cilantro and mint) – not to mention carrot cake in orthodox cream-cheese icebox dress, or coconut flakes in its vegan version. The new East Village store opened Aug. 22, returning to the neighborhood where Michele and Vinnie Garcia opened their first organic bake shop two blocks away in 2004. 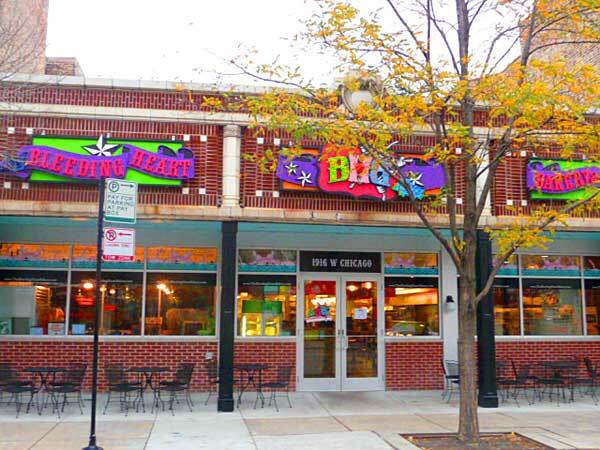 Since then branches have located in Roscoe Village, Oak Park and Elmhurst, and the Garcias' pastry prowess has been documented in multiple Food Network challenges, most recently the Halloween episode of they mystery-meat contest "Chopped". A Jan. 3 membership vote on the cafe's rooftop deck started the year for EVA. The restaurant shares the same management team as Roots Handmade Pizza next door. Visitors can order from the Roots menu should they crave Quad Cities style pizza or simply wonder what that is. Roots also features a salad named for the alderman; much as we like the beet salad, it is not called Eva's Choice.